Light A form of radiant energy. Attached Shadow Is definitely fixed to its object. Cast Shadow This shadow always falls on something. 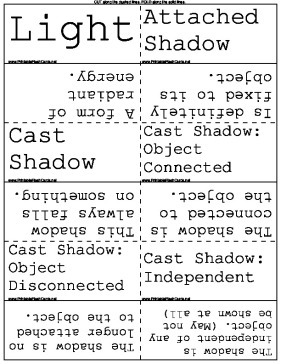 Cast Shadow: Object Connected The shadow is connected to the object. Cast Shadow: Object Disconnected The shadow is no longer attached to the object. Fast Falloff The contrast of light and dark is severe. Slow Falloff The transition of light and shadow is gradual. Elimination of falloff The whole subject is lit up without any shadows. High-key Lighting The scene has an abundance of bright, usually slow falloff illumination and a light background. Low-key Lighting Selective, usually leaving the background and surrounding areas dark. Above Eye-level The eyes of the subject or the middle portion of the object. Below Eye-level The attached shadows reverse vertically and are exactly opposite their expected positions. Predictive Lighting A sign of a coming event using lighting techniques. Dramatic Agent An element that operates as an aesthetic intensifier in a scene. Triangle Lighting The triangular arrangement of key, back, and fill lights, with the back light opposite the camera and directly behind the object , and the key and fill lights on opposite sides of the camera and to the front and the side of the object. Key Light Principle source of illumination. Back Light Separates the figure from the background and provides sparkle. Side Light Comes from the side of the object, acting as an additional fill light and providing contour. The Kicker Comes from the back, is usually from below and off to one side. Background Light Illuminates the background, which can be the actual set of an interior or some kind of backdrop. Cameo Lighting Illuminates the foreground figures while leaving the background totally dark. Flat Lighting Uses highly diffused light that seems to come from all directions. Silhouette Lighting The background is lit up not the figure. Color The property of light, not objects or liquids. Color Perception The object reflects parts of the light spectrum and absorbs the rest. The reflected light is focused by the lens of the eye onto the retina. Hue Hue describes the color itself. Red, blue, green, and yellow are hues. High and Low Saturation Saturation describes the color richness. Brightness The brightness of a color depends on how much light it reflects. Brightness is called lightness when it refers to how bright we perceive an object to be. Additive Primary Colors Red, green, and blue. Subtractive Primary Colors Cyan, Magenta, and yellow. Additive Color Mixing You can produce a great number of different hues. Subtractive Color Mixing They swallow one another's light until no light is passed. High & Low-energy Color Distribution Sets off a high-energy color against a low-energy background. Color Distortion With high-contrast lighting, it heightens its dramatic impact. Saturation The relative strength or purity of a color. Achromatic White, gray, and black.